I've spent most of the last week under the weather. Nose blocked, hacking cough and a temperature. This on top of a bad bout of vertigo has left me struggling to accomplish anything. Trying to write on here or even look at a screen has made my eyes spin round in my head and the sensation like I'm going to fall down. I've had to take things easy and keep my head still as much as possible. So I've been lying on the sofa, binge watching The Walking Dead whilst drinking copious amounts of Irn Bru (as every Scottish person in the world knows this cures everything) and I'm finally starting to feel a little more like myself. Yesterday I even managed to bake. 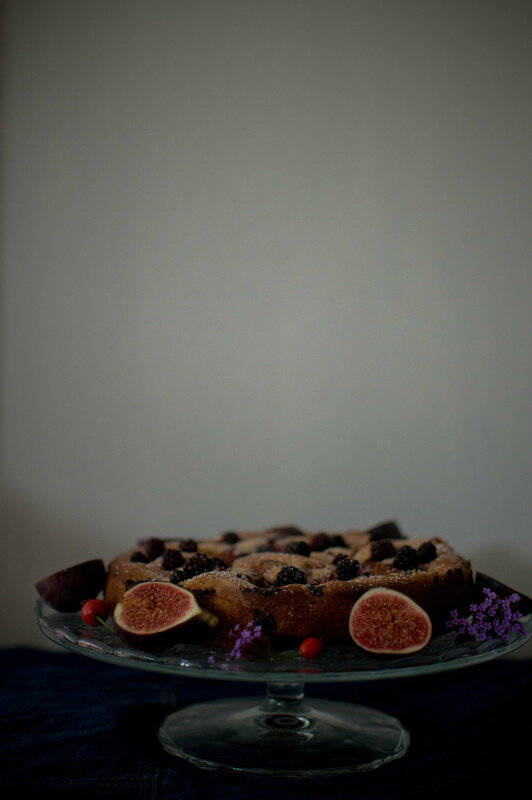 This is a simple cake that totally embraces the season and I used fresh English plums (one of my all time favourite fruits), figs and some foraged blackberries (that I have frozen in batches to keep me going through the winter). It also has the added indulgence of having big chunks of marzipan running through it that go beautifully chewy when baked. Perfect for Fika or pudding with some cream poured over the top, enjoy on a #slowautumnday. Grease and line a 20cm springform cake tin. In an electric mixer, cream the butter and the sugar. Add the vanilla and almond extract. Mix again. Fold in the flour and baking powder. Add the sour cream and the marzipan. Stir gently. Pour into prepared tin. Scatter the fruit over the top. Bake for about 1 and a quarter hours until a skewer comes out clean. Allow to cool in the tin for ten minutes before transferring to a wire rack. Dust with a little icing sugar. Adapted from a recipe by Diana Henry.